> Stand a chance to win attractive Pirelli prizes worth up to $2,250. Stand a chance to win attractive Pirelli prizes worth up to $2,250. 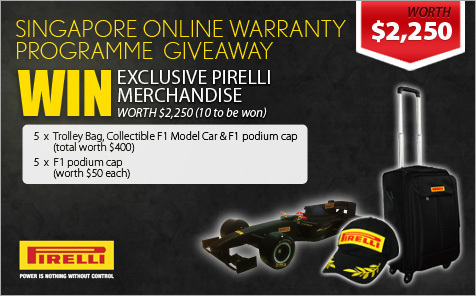 Take part in our sgCarMart contest by answering questions about Pirelli's Tyres Warranty Programme in the month of March and stand a chance to win attractive prizes worth up to $2,250. Also, check out this month's deals, promotions and discounts that shouldn't be missed, specially for sgCarMart/MyCarForum members! The resulting effect is a more efficient engine without any modification to your existing engine. E-Power System installation is fully reversible; i.e. The System can easily be removed whenever required and your engine will be back to its original state before the installation of the E-Power System devices. E-Power System can be re-installed on another vehicle thereby making your investments “value for money”. Celebrating 11th anniversary special with 50% free upgrade! Free trial. Money back guarantee! Islandwide drive home service at only $38. Try your luck in gambling but not with the law! Enjoy being driven home at the comfort of your automobile at a cheap rate of $38 per trip! How big is the F1 model car? I want the trolley bag!